By way of introducing myself, I'd like to respond to Deanna Cullen's blog post about social media here on ChemEd X with some ideas of my own. The reason I'm here is that Deanna found me through following one of the chemistry-related Twitter chats and invited me to join ChemEd X as a contributor. I currently teach IBDP Chemistry at the American International School of Bucharest. Since my early days as a teacher, I have utilized technology throughout my instruction. I also incorporate some ideas from the modeling chemistry movement to help my students understand chemistry at the particle level. I'm hoping to share some ideas that will inspire you to try new things, and I'm also expecting to learn a lot from all of you that interact with us here at ChemEd X.
I would like to share some of the ways I use Twitter in my professional life. First and foremost, I have an amazing network of friends and colleagues on Twitter (a.k.a. Tweeps) that make up my Professional Learning Network (PLN). I am inspired by my interactions with them. They constantly share ideas through their Tweets, Retweets, blog posts and links. They also form a great resource for my questions. Any time I'm interested in trying something new or stumped by a problem, I'll put up a Tweet and invariably get responses that are very helpful. #chemchat: A chat for all things chemistry-related. HS Chemistry teacher @jmbalaya helps organize a weekly chat at 5:00 PM PST. I'm asleep in Eastern Europe for these chats but I always go back through them to get ideas and respond to ideas that are put forth. I have too many names to mention here without forgetting somebody. Suffice it to say you will find all manner of discussion here about teaching chemistry. #modchem: This is a hashtag to follow if you are interested in following the modeling chemistry movement. Many of the teachers involved share images of student-created whiteboard diagrams, inspiring ideas for my own class whiteboarding. #scichat: A chat for all things science-related. #180blog: This hashtag is used by teachers that create a blog post for each day of the school year. It is not chemistry-specific but there are some fantastic ideas generated within these posts. I've posed questions to some of the bloggers here to further the discussion and get clarification on an idea. I've also used some of these Tweets to expand my PLN and find new teachers to follow. And finally, in light of the recent chemical accident, I saw #chemsafety pop up on my timeline also. This is worth following to see if it develops a critical mass of participants. I have also begun to follow science bloggers and working scientists in order to stay on top of new developments and satisfy my curiosity. By no means is this an all-inclusive list, but I'd like to share a few names here as well. @DeborahBlum: Author of "The Poisoner's Handbook" and a blogger for Wired: Science. She loves to delve into the chemistry of poisons along with other everyday life connections. I've had my students respond to some of her blog posts from a previous site she wrote for and she took the time to respond. @compoundchem: Self-proclaimed graduate chemist that explores the chemistry of everyday compounds and creates interesting infographics that I've shared with my class. @Sci_ents: Runs the aptly-named chemistry-blog.com that covers quite a few topics the stir my curiosity. @cenmag: The official Twitter account for Chemical and Engineering News, that familiar publication from the A.C.S. @ChemEdX: And of course you should follow the official Twitter account for us here on the ChemEd X! To organize my Twitter life, I use the Chrome Extension TweetDeck. I have several columns set up for my Twitter accounts, hashtags I follow and Mentions and Direct Messages. I can follow and un-follow users from within TweetDeck also, making it simple to expand my PLN when I see a Tweet from somebody interesting. Look me up on Twitter (@ThomsonScience) and say hello. Check out the list of people I follow to get other ideas not mentioned here. What other ways have you used Twitter in your professional life? Do you have chemists and/or teachers you recommend to follow? Hi Lowell! I'm so excited to be joining you on the ChemEdX! I too met you via twitter earlier this year through the hashtag #modchem. I thought I'd share something about how I'm using twitter in my classroom. My school is currently in the middle of our J term (three weeks in January where every student takes only 1 class and teachers are given freedom to develop a class of their choice) I'm teaching a three week seminar on Harry Potter. Like much of the midwest, we were snowed in during the recent polar vortex and missed the first three days of class. In an effort to engage the students in discussion while they were out of class I started tweeting using the hashtag for our course #pottermania. My students were following the tag and tweeting me and their classmates with trivia questions and discussing questions I posed. It was a fun activity to keep us busy as we waited for the snow to melt and it got them excited about the class they were coming into. The activity also showed them the power of twitter. Before this class, most of my students didn't know how to follow hashtags, now they can tap into the twitterverse as a resource in the future. I appreciate the suggestions of feeds to follow. I learned some things from your post, Lowell. Can you elaborate on the Chrome Extension Tweet Deck? Erica, thank you for the additional suggestions and discussion about how you use Twitter with your class. I'm trying to encourage my students to use it as well and will be making a more concerted effort with a new class next semester. I'll likely share the successes - and areas to improve - in a future post near the end of the school year. Deanna, I'm glad you learned a few things. I'm happy to share about TweetDeck. I have included a graphic attached below to show you the ropes a bit. I have three Twitter accounts that I manage. One is for personal fun such as following my favorite sports teams, my college and friends. My second account (@ThomsonScience) is used for my PLN, as described in my post. My third account I use to communicate ONLY with students. I do not follow anybody with this account, thus my timeline contains only my tweets and retweets. 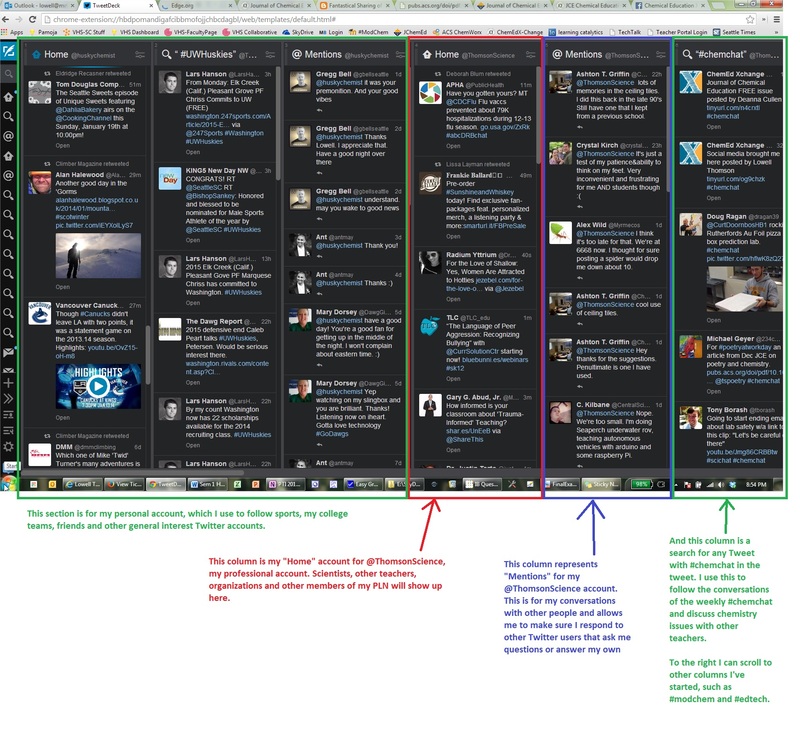 The diagram shows you a few of the columns I have set up in my TweetDeck, but there are many more that I can scroll to on the right. I can also post new tweets and search within TweetDeck. If I find an interesting user while browsing a chat, I can follow the user from within TweetDeck without having to go to Twitter. This makes my consumption and production of Twitter content much more efficient. Checking TweetDeck is one of the last things I do before going to sleep and one of the first things I do in the morning. And when I'm on the go, I use an app on my tablet that is similar to TweetDeck called TweetCaster. This looks very useful! I have just transitioned to a macPro and an iPad. Can you (or another reader) suggest a similar app or extension for Apple? I agree with Doug! I was going to suggest HootSuite as well. You can also "schedule" tweets. You can pre-type the tweet whenever you have the time, but schedule it to go out at a time where twitter traffic is higher to improve the chances someone will run across it in their news feed. Thanks for the suggestions! I am sure that I am not the only veteran teacher struggling to keep up with social media. I hope you "techies" will continue to share your wisdom!